Inspired by the real story of investigator Kate Warne, this spirited novel follows the detective's rise during one of the nation's times of crisis, bringing to life a fiercely independent woman whose forgotten triumphs helped sway the fate of the country. With no money and no husband, Kate Warne finds herself with few choices. The streets of 1856 Chicago offer a desperate widow mostly trouble and ruin - unless that widow has a knack for manipulation and an unusually quick mind. In a bold move that no other woman has tried, Kate convinces the legendary Allan Pinkerton to hire her as a detective. Battling criminals and coworkers alike, Kate immerses herself in the dangerous life of an operative, winning the right to tackle some of the agency's toughest investigations. But is the woman she's becoming - capable of any and all lies, swapping identities like dresses - the true Kate? Or has the real disguise been the good girl she always thought she was? Like any Chicago tavern in deep summer, Joe Mulligan's stank. It stank of cigars smoked the week before, months before, years before. Tonight's smoke pooled against the basement ceiling in a noxious cloud. I acted like I smelled only roses. The woman I was pretending to be would have done the same. I was also pretending the sharp tang of men's sweat surrounding me didn't terrify me. These were not good men. But I wasn't a good woman, not tonight. My mission was to ignore the smoke and the sweat, blind a bad man with a wicked smile, and wring out his secrets. There would be no second chance. 1. Widowed and without job prospects, Kate answers a newspa- per advertisement for a job as a Pinkerton operative. What do you think she would have done if Pinkerton hadn't agreed to hire her? 2. Kate is unsentimental about the death of her husband, Charlie. Did you find this surprising? What did you suspect was the reason for her unusual detachment? 3. When Graham DeForest meets Kate, he is flirtatious and solicitous, and Kate believes he is a ladies' man. When she follows him to practice her surveillance skills, she finds this is definitely not the case. Did you suspect his secret? ...[T]his is precisely the type of novel to read if you want to get your pulse racing. However, that isn’t the only reason to read this book, because it also reminds us that America has a rich history filled with remarkable women. While some of these women worked for the greater good as champions of many worthy causes, others were outstanding by virtue of their struggle to succeed as individuals and professionals, on their own merits in a man's world. What a pleasure to learn about one of these women, especially one we know so little about, through Macallister's eloquence and artistry! (Reviewed by Davida Chazan). A celebration of a singular woman's life that's guided by facts but features some inviting imaginings. Macallister's story is a rip-roaring, fast-paced treat to read, with compelling characters, twisted villains, and mounds of historical details adeptly woven into the tale of a courageous woman who loves her job more than anything or anyone else. Starred Review. Loaded with suspense and action, this is a well-told, superb story. Electrifying...a rollicking nineteenth-century thrill ride. Inspired by a real-life story, Greer Macallister has created a fast-paced, lively tale of intrigue and deception, with a heroine at its center so appealingly complicated that she leaps off the page. From the underbelly of Chicago to the front lines of the Civil War, Girl in Disguise crackles with spirit, and the trailblazing Kate Warne is a character I would follow anywhere. In Macallister's confident hands, this novel is packed full of adventure, moxie, and heart. I dare you not to get hooked. All hail a mighty woman in a man's world! Greer Macallister aims her pen at Kate Warne, the first female Pinkerton detective, and hits the mark with this rousing, action-packed adventure. Macallister is becoming a leading voice in strong, female-driven historical fiction. Exciting, frightening, and unspeakably moving. Many great novels start with a premise, which mirrors or takes inspiration from something in real life. In Greer Macallister's Girl in Disguise, the inspiration is the real-life Kate Warne, the first female private detective who began her career with Pinkerton's in 1856. Learning about her made me wonder which came first  did the concept of creating a woman detective rise from some writer's fertile imagination, or was Warne the inspiration for the first fictional female sleuth? 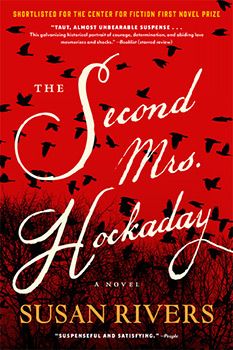 A love story, a story of racial divide, and a story of the South as it fell in the war, The Second Mrs. Hockaday reveals how this generation - and the next - began to see their world anew. An enthralling novel based on the forgotten true adventures of one of the nation's first female deputy sheriffs.